This weekend I had the pleasure of presenting my session “SharePoint Upgrade or Migration, or is it both?” at SharePoint Saturday Madrid in the cool offices of Microsoft. I’d just like to say thanks to all my attendees and can access the slides. The event was very well organised by Juan Carlos González Martín, Miguel Tabera and Edin Kapić with the rest of the @SPS_Madrid staff. So I thank you for having me and would love to come back again next year! It was also great to meet the regular speakers and other speakers for first time, and you can access some pictures that hopefully sums up the event! 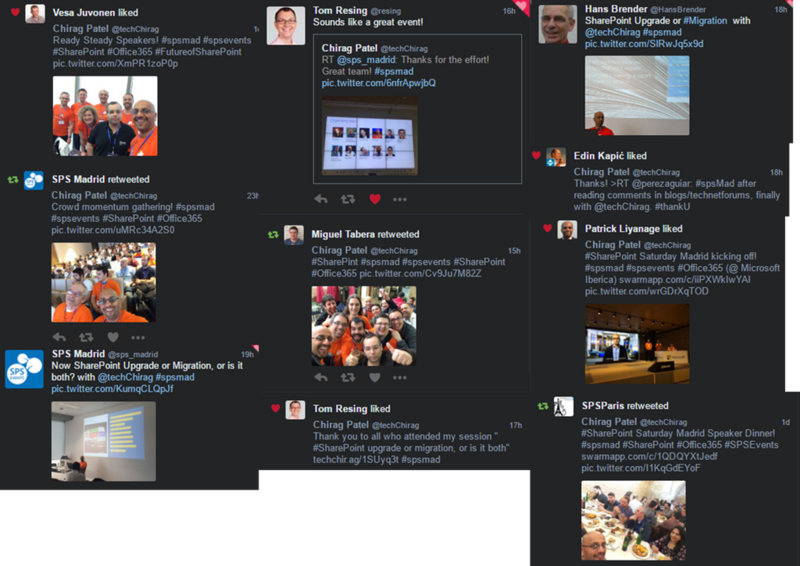 Below were few twitter interactions from the #SPSMad too!